Tom Leech and James Bourland, the keepers of the Press, happily agreed and turned their “office” into a working classroom for the students. You can understand typography with your head, but it’s another thing to know it in your hands — “the Gutenberg way,” Nathan said. Leech chose to focus the lessons on Jose Guadalupe Posada, a talented and prolific Mexican illustrator well-known in part for his political cartoons. 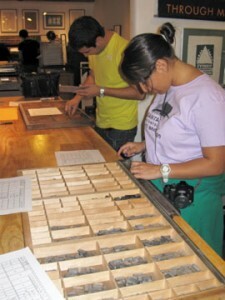 After hearing a lecture about Posada and viewing his original work with Bob Bell, a local collector and authority in the field, the students poured into the Press. As a group, they agreed to create a broadside for the Day of the Dead about President Obama. 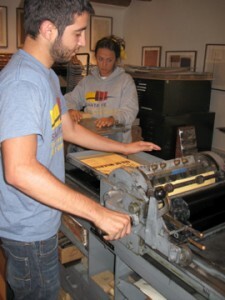 On Sunday, Oct. 31 (yes, Halloween), Nathan’s students will sell the product of their efforts at the New Mexico Museum of International Folk Art from 1-4 pm — or as long as the broadsides last. In true Posada style, the students, who will don calavera clothing for the museum’s Day of the Dead event, will ask for only a quarter in return. Yup. Twenty-five cents. Two bits. The same pittance that might otherwise buy a mere 15 minutes of downtown Santa Fe parking. “It’s a broadside for centavos, Posada’s tradition come to life, not to mention a huge celebration for Dia de los Muertos,” Nathan said. 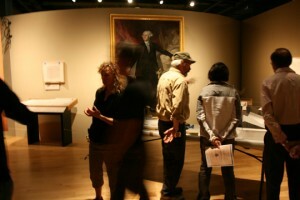 On Thursday, we took a small group of journalists through the still-under-construction exhibit for a sneak peek. And we figured you deserved to ride along. Here, the installation crew buzzes in the part of the gallery where we’ve hung Giuseppe Perovani’s 1796 portrait of George Washington. Many Americans are unaware of the critical role Spain played in helping to win the Revolutionary War. Perovani lived for several years in the United States and, in 1801, with the prestige he had earned, went to Cuba on contract with Archbishop Espejo to help decorate the Cathedral of Havana. He also worked as a teacher there and, afterward, moved back to Mexico, where he became an academic of merit and second director of painting in the Academia de Bellas Artes de San Carlos. This portrait was likely commissioned by Jose de Jaudenes y Nebot, Spain’s representative in Philadelphia. Jaudenes knew Washington through Thomas Jefferson and had also been consulted on the negotiation of borders. 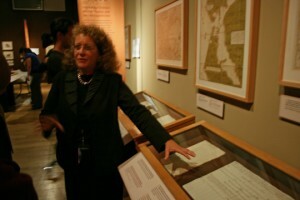 Dr. Frances Levine (left), director of the museum, points to and talks about one of her favorite pieces in the exhibit,a 1786 agreement, hand-written in the Palace of the Governors, between Gov. Juan Bautista de Anza and Comanche Captain General Ecueracapa. The agreement laid out how much help de Anza would receive from the Comanches in an action against the Apaches. 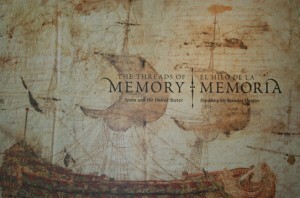 Dr. Levine says that when she first saw the Threads of Memory exhibit in Sevilla, Spain, this particular document not only brought her to tears but convinced her to lobby for its American debut in Santa Fe. The fact that it was written in the same building that she works in every day carried special meaning, along with a deeper knowledge of the conditions that both colonists and Native peoples lived with. Some of the media members who came to our preview was the EFE News Agency of Spain, which is preparing a story for distribution across that nation this weekend. 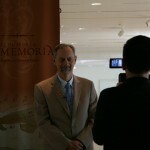 Among EF’s interviews was one with Santa Fe Mayor David Coss. 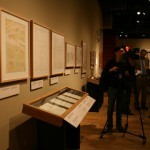 The city of Santa Fe, celebrating the 400th anniversary of its founding by Spanish colonists, played a key role in bringing the exhibit to life here. La Belle, a ship, was part of an attempt by France to displace the spreading power of Spain on the lower Mississippi and what is now the American Southwest. The expedition was led by René-Robert Cavelier, Sieur de La Salle, who left France with four ships to claim and colonize the area around the mouth of the Mississippi for France. En route, one ship was lost to pirates, one ran aground, its cargo taken by local natives, and one returned to France. La Salle continued to sail La Belle but missed the Mississippi by some 400 miles, landing on the Gulf Coast, not far from what is now Corpus Christi. The ship was later lost in a storm with about 20 survivors, including La Salle. In 1995, less than 12 feet deep, the remains of the ship were discovered and recovered by the Texas Historical Commission. At 2 pm on Dec. 19, Eric Ray, a maritime archaeologist with the Texas Historical Commission, will deliver a lecture about La Belle in the History Museum Auditorium. Finally, meet part of the people responsible for bringing the exhibit here. 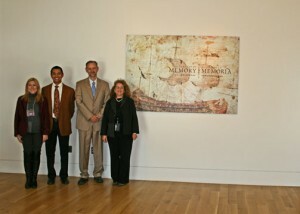 From left, Falia Gonzalez, Spanish curator of the exhibit from the Archivo General de Indias; Josef Diaz; Mayor Coss; and Dr. Levine. Please join us for this weekend’s activities — Saturday’s private reception (tickets $100 at the Lensic) and Sunday’s grand opening. Each week through Jan. 9, we’ll have The Threads of Memory Lecture Series — all of it free with museum admission. (Remember: Children 16 and under are always free; Seniors free on Wednesdays; NM residents free on Sundays; and everyone free 5-8 pm Fridays.) Bring your family and enjoy learning more about our rich Spanish roots.